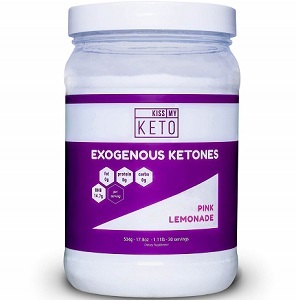 Read our full review on the product Exogenous Ketones, manufactured by the company Kiss My Keto: It is claimed by this company that their product can boost energy levels immediately, increase mental focus, increase ketones, decrease hunger cravings, boost metabolism, as well as augmenting endurance and stamina. This implies that it may be used as a pre-workout supplement. The recommended daily dosage according to the manufacturer is one (1) full scoop of powder in 8 ounces of water, daily. There is a warning not to exceed two servings per day. This mixture may be taken 1) in the morning as an energy boost, 2) before a workout, or 3) as a meal replacement. Too many exogenous ketones may lead to an upset stomach. However, this will change as the body adjusts. Still, to be careful, reduce the dosage should upset occur, slowly increasing it to the optimal dose. An 18-ounce or 30-serving container is available online, direct from the manufacturer at $49.95 (including shipping fee anywhere in the US). No discounts are given, although the company does offer a subscription service. When locked into a subscription, the purchase price drops slightly to $42.46 (this includes shipping fee and a 15% discount). However, with a subscription service, it is often difficult to exit the contract; meantime the subscriber’s credit card continues to reflect a monthly deduction. The manufacturer does offer a full-satisfaction money-back guarantee on this product. Returns must be made within 60 days of purchase. The guarantee is only applicable on orders within the US. There are many positive reviews of the product on the company’s own website. In addition, of the 197 reviews (mostly indicating that the product is average) on Amazon, our research found that 80% of these are trustworthy, and have minimal deception involved. Exogenous Ketones appears a useful product that offers many health benefits, ranging from weight control to boosting of energy levels. The company’s website is well designed and comprehensible, allowing a consumer to make an informed decision. Another good point about this supplement is that the company offers a 60-day money-back guarantee on their product. That said, there are certain concerns to mention. The company does not offer any discounts on bulk orders, which could have made this product economical. Instead, the company offers only discounts on their subscription service, which locks a consumer in and from which it is difficult to extricate oneself. Another concern is that, even though the reviews on the company’s own website are extremely positive, our research found that on a third-party site such as Amazon, the ratings were merely average, with 80% of these being of high quality. Therefore, the reviews on the company’s website might be biased or misleading. As such, with so many similar products on the market offering better deals and having better reviews – it might be better to look into one of those instead of this product. John Parker	reviewed Kiss My Keto Exogenous Ketones	on February 23rd	 and gave it a rating of 3.5.